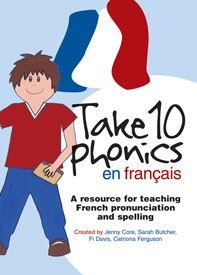 Take 10 phonics en français has been written by expert teachers in Devon and is aimed at teachers and learners of French in both primary and secondary schools. Teachers asked for more support with pronunciation, sound-spelling links and the skills needed for phonics teaching. Learners become more independent and confident in their language learning when they build on what they already know about phonics in English. This resource comprises an interactive DVD with sound and video files, fun activities to practise each phoneme, teachers’ notes and printable charts and flashcards to support the teaching. The instructions for use are provided on a PDF file on the disc. Take 10 phonics en français has been developed for use with children aged 5-14 (KS1, KS2 and KS3) who are learning French. This is a suitable resource for a non-specialist teacher.